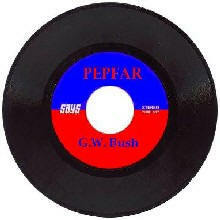 (February 20, 2008) President George W. Bush is already grabbing headlines with his latest self-congratulatory album, PEPFAR: True Leadership, and his accompanying farewell promotional tour across Africa. Between February 15 and 21, he travels to the countries of Benin, Tanzania, Rwanda, Ghana, and Liberia to promote this musical swan song – a concept piece that highlights his supposedly groundbreaking leadership in the fight against global HIV/AIDS. As with Bush’s previous productions, this latest record will frustrate music lovers with serious lyrical flaws that illustrate the ineffectiveness of the U.S. response to the HIV/AIDS pandemic in Africa. In his plucky first single, My Plan, President Bush reminds listeners of how he chose in 2003 to create his own unilateral program, the President’s Emergency Plan for AIDS Relief (PEPFAR), rather than pledge full U.S. support to the already established and internationally acclaimed multilateral initiative known as the Global Fund to Fight AIDS, Tuberculosis and Malaria. Bush’s catchy lyrics fail to mention how PEPFAR created a duplicative bureaucracy grounded in an emergency response mentality that challenges its sustainable effectiveness. Equally absent from the liner notes is any acknowledgement of the low levels of PEPFAR’s overall funding relative to the scope of the global HIV/AIDS crisis, of which Africa remains the epicenter. President Bush touts his favored abstinence-until-marriage HIV prevention strategy on the album’s second single, “A.U.M”. The melody here is simply out of tune. As a result of an earmark in the PEPFAR legislation that privileges abstinence-until-marriage programs, the distribution of U.S. global HIV/AIDS funds has undermined access to life-saving condoms. African community organizations that implement PEPFAR funded prevention and treatment programs have been frustrated by this ideological limitation, which restricts them from responding to the distinct needs of their communities. Uganda, held up as an African success story because of its success in reducing HIV rates over the past decade, achieved progress through a comprehensive national prevention campaign that promoted abstinence, being faithful and condom usage (the ‘ABC’ approach). Uganda currently risks reversing this progress because of the Bush-driven shift away from education on condom use. In the upbeat Profits Versus Lives, Bush attempts to lift the tempo as he defends his administration against claims that they prioritize corporate profits over African lives. While the chorus declares that PEPFAR uses the most cost-effective medications available to treat HIV-affected individuals, Bush’s pithy lyrics don’t stand up to the facts. In 2006, brand name manufacturers produced 73% of the lifesaving anti-retroviral drugs purchased with PEPFAR funds, totaling 20% of all PEPFAR funding that year. While PEPFAR does not explicitly forbid money from being spent on generic anti-retroviral (ARV) drugs, the Bush administration refuses to accept World Health Organization (WHO) evaluations of drug purity, safety and efficacy, instead relying solely on the U.S. Food and Drug Administration’s screening process to choose which drugs are PEPFAR eligible. This unnecessary procedural bias means that few of the cheaper, internationally produced generic drugs can be purchased for PEPFAR treatment programs, reducing the efficiency of U.S. taxpayer dollars and placing fewer Africans on life-saving ARV-treatment. Doubling the Dollar, a mid-album track, stands out only for its lack of creativity and disingenuousness. Bush repeats like a broken record the claim that his proposed $30 billion over the next 5 years represents a doubling of funding for the second version of PEPFAR. This simply isn’t true. In fiscal year 2008, the United States is spending around $6 billion on global HIV/AIDS programs. Do the math, and $30 billion over 5 years equals flat funding – an approach that fails to keep up with the expanding demand for treatment. First, support the full U.S share of the Global Fund and increase overall funding to the levels public health experts agree are necessary: at least $50 billion by 2013 for HIV/AIDS programs alone. Use generic drugs approved by the WHO to maximize the impact of each dollar spent. Eliminate the unscientific abstinence-until-marriage earmark to give African partners the flexibility to address the HIV/AIDS pandemic based on the actual needs of their communities. Integrate programs that address gender-based violence into PEPFAR, and make sure that the program reaches the most-affected populations. Finally, cancel Africa’s illegitimate debt so that African countries can direct their own funds to build sustainable health infrastructure, train health workers and research affordable prevention technologies.